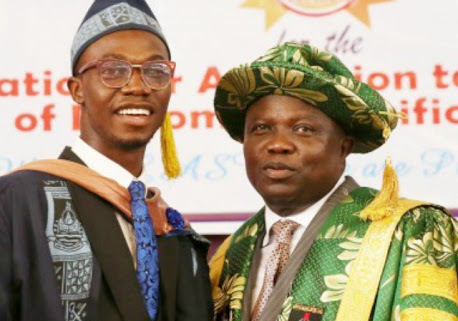 Governor Akinwunmi Ambode has adopted the overall best graduating student of Lagos State University (LASU), Fuad Adetoro Ogunsanya, who finished with a Cumulative Grade Point Average (CGPA) of 4.78 in Business Administration. The governor gave Ogunsanya N5million, pledging to sponsor his postgraduate studies in any school of his choice worldwide. At LASU’s 22nd convocation yesterday, Ambode said he rewarded Ogunsanya for his doggedness, despite the health challenges that delayed his education. Ambode said he had a similar story. He said: “The Lagos State government does not generally give scholarship anymore, but your story is too compelling and is a reflection of my own story. I will adopt and sponsor you anywhere you want to go for your Master’s. I will personally be responsible for it. In his valedictory speech, Ogunsanya told how cataract in both eyes affected his performance in the Senior School Certificate Examination (SSCE) and delayed his education. The 24-year-old, who lost his father in 2015, said he had to do a second surgery to remove the defect when the first failed before he was able to make his ‘O’ Level papers. “I eventually had a successful surgery at the University College Hospital (UCH) in Ibadan (Oyo State capital) before sitting for the West African Examinations Council (WAEC) and getting admission into LASU. I wanted to study Accounting, but at that time the course was not accredited and Business Administration was available. So, I had to grab it. Today, see where that impromptu decision has brought me,” he said. Ogunsanya said Nigerian graduates had a lot to offer, urging employers to give them a chance.